Support to mod_http2 to speedup hosted domains access. Moderator note: This was implemented in EasyApache 3 already, so I've adjusted this request to be specifically for EasyApache 4.
mod_spdy is an open-source Apache module that adds support for the SPDY protocol to the Apache HTTPD server. This allows for faster page loading and more efficient bandwidth utilization when loading https URLs in SPDY-enabled browsers. This would be amazing for cpanel customers! Who doesn't want a faster, more responsive site? Enable http2 server push on Cpanel for a huge increase in page loading speed. As a server administrator, I would like cPanel to natively support HTTP/2 server push in order to increase site speed and decrease load times. CloudLinux doesn't yet fully support this, but hopefully they will publish this to their production repo soon. The changelog hit a snag, but will hopefully be updated soon. If you have any other questions, feel free to reach out! The forums will be a great place to work together on this. It appears that mod_spdy was donated to the Apache foundation for inclusion in Apache core for the HTTP2 protocol, which should be released by Apache sometime in 2015. Running mod_spdy requires a custom installation of OpenSSL, which we do not support at this time. We look forward to Apache integrating mod_spdy with the Apache core next year. However at this time, we will unfortunately not be implementing mod_spdy at this time. why we need to start this all over again? Is clearly that once was requested in EA3, we want it in EA4 too. There was no point in marking the old post as completed and closing, since first of all cPanel doesn't want to officially support it in EA3 and is not even started in EA4. Once you release a new version with less features than the last one, is no longer called an upgrade, more likely a downgrade. EasyApache 3 has no support for http2, it only provides a way to personalize the options to compile Apache and you have to set your own compilation of openSSL. cPanel has taken this post about to EasyApache 4 to close the post for EA3, even it has not been completed. First, thank you so much to everyone here for your quick, verbose feedback. I do hear your frustrations, and am glad to see that you're still interested in providing your feedback! Our biggest hesitation with this is that in order to use HTTP2, you need to have OpenSSL 1.0.2. Taking ownership of, and shipping our own RPM for, OpenSSL is something we cannot consider lightly, and is something that we currently aren't planning to do. We definitely understand that it's something that many of our customers want, but we currently haven't decided to take on that burden. Thanks for your continued attention, and definitely let me know if I can answer any questions! Using a custom installation of OpenSSL just for the entire web server stack would help to solve a lot of issues. cPanel needs to put more effort into the core services related to serving sites, and less into cPanel/WHM features like SSL stores, external authentication systems, and security analysis. source compiled OpenSSL 1.0.2+ statically just for nginx also allows you more timely openssl related updates that RPM would provide - just look at last few openssl rpm updates especially slow, or will not fix or delay from redhat etc. It's a fine line between using official OpenSSL rpms and keeping OpenSSL up to date in a more timely manner than rpm repo would provide. As a web hosting cpanel and LAMP solution, you can't afford to have lengthy delays for security fixes that are delayed in OpenSSL rpm repo sourced vs being able to compile from direct source the latest release. cpanel should allow Apache to support either system OpenSSL 1.0.1e usage or statically compile against own OpenSSL 1.0.2+. Flexibility allows cpanel's Apache to meet the changing needs at the time more quickly. We deployed a while back http2 on our Nginx reverse proxies which were running CentOS 6 by statically compiling OpenSSL 1.0.2. It works really well and doesn't force us to upgrade to a newer distribution. Maybe cPanel can do something like this? There are certainly a host of possible ways we might implement this. If we get closer to actually doing it, we'll definitely let everyone know here! Hey all! No further updates yet, but I did realize that there was an old mod_spdy request that was not merged in here. We wanted to merge them together in order to get a more accurate count of people asking for HTTP/2 support. I will post here as soon as there is an update to provide! This site is so poorly coded I can't tell if my post was sent of not using mobile. Anyways. Enabling h2 without Chacha20/Poly1305 forces android to keep AES-NI libraries loaded the entire time your site is open in a tab. This drains Android batteries at a MUCH higher rate. If you can't figure out how to get us back to EasyApache 3, where we can do this stuff ourselves, I'm moving all my customers to your competitors. EasyApache4 is SEVENTY PERCENT slower at serving websites than we had EA3 running. Thanks for the heads up, I'm adding this patch in now. I'd like to work with you to see if we can figure out what's going on that's causing your systems to be slower. Mind emailing me? Edit: I've patched and updated builds. If you have the above installed, a yum update should pull down the changes. I really appreciate your feedback! My main problem is the fact that I've had to choose between sites that wreck people's batteries, or not having h2. For business customers who have employees that have to login to their sites from their phones a lot, draining their batteries isn't really an option. I have an extra box sitting around at moment with absolutely no paying customers on it (I planned on attempting exactly what you are doing next week). I'll test this on it later tonight. Now that I have customers using the multi-php I'm going to have to pay extra attention to how it affects that though. TBH I'm not overly a huge fan of this RPM system. It's only a matter of time before people start playing with it and borking their entire install force overwriting system files. Not to mention doing this RPM build is a WHOLE lot more involved than unzipping a file somewhere and telling EA what options you want it to pass. .... It used to be unzip a tar to a certain place and add some text to a file.... Maybe run a yum command. It basically feels like the things we've been paying you for got deleted so it could be easier for cPanel devs and you've dumped the extra work on us, because let's be honest. cPanel hasn't been the greatest here lately. We won't even be able to install SSL certificates into accounts on cPanel without CAA records later this year and no one at cPanel even had a clue about it until it was mentioned in a feature request. Wasn't even on the radar to be looked into adding at the time according to staff. Seems as if you guys want to make things easier for yourselves no matter what repercussions it has to the customers. The fact that people are building web server rpms and adding them to repos that don't even know about the current common pitfalls of building a web server from hand kind of shakes my confidence in what's going on there at cPanel. Hey everyone! Comments were locked overnight. Please do keep the conversation specific to *this* request, and take any other conversation you want to have to the forums or to a personal email conversation. Thanks for the 'howto'. We tried this out on one our our productions servers running Centos 6 and it works great so far with no errors encountered. Our other servers run CloudLinux 6/7 with mod_lsapi is that module likely to cause a problem with HTTP2 ? I'm glad to hear it! This is a *very* experimental setup. It's so experimental that I'm keeping it on my personal OpenSuse account until we can get it through our QA & security team. Unfortunately, CloudLinux will most likely not ship these packages until we get them into our EA4 mainline repo, which could be a while. I'll work on getting these into our EA4-experimental repositories this week. Can do adding automatically without manually file edit? This will be done when we officially release http2 support. We want to ensure the protocols work for most people on setup before we enable it by default. Any idea when the release date is...? We don't have an anticipated release date at this time, but as soon as we do we'll update here! If all went well, you should be back with http2 running. If you got RPM dependency issues with Apache, you'll probably need to downgrade 'ea-apache24*' again. Please note, there was a brief period where it didn't link properly. A 'yum update' should pull down the latest changes. Please provide feedback and let us know how it goes! Removed earlier version and installed latest, all working great and noticed some websites do now load faster! _CRS/3.0.0"] [maturity "9"] [accuracy "9"] [tag "application-multi"] [tag "language-multi"] [tag "platform-multi"] [tag "attack-protocol"] [tag "OWASP_CRS/POLICY/PROTOCOL_NOT_ALLOWED"] [tag "WASCTC/WASC-21"] [tag "OWASP_TOP_10/A6"] [tag "
I habe got the same problem. I tried it with skip-broken, but this doesn't helped either. You have to wait for CloudLinux to release their EA4 packages. They're already working on it. These files aren't available on CLN yet. I have tested it and so far so good, seems to be working just fine. The only issue I found is on Apache Status page, instead of showing to were the request was made I get some status info, is this normal? Work fine on non-cloudlinux install ! Nice to see we are getting closer to http/2. Any idea when this will move from experimental to general availability ? Nothing definite, but what we've got right now it's solid enough to go to general availability yet. If things stay on track internally it'll go to production within 2-4 months. Let me know if you have any other questions! works great :d and hope be included on cpanel 64 when comes GA. Tried it from CL7 EA4 experimental repo yesterday and it seems to work fine. Great to see all reports on HTTP2 working just fine! Hope it can leave experimental stage soon! I can confirm that this is now also working on CloudLinux as well. As of today when loading up the module; the following error occurs. I'm rebuilding the http2 package now with the latest Apache changes. I hope to have this published to the experimental repository shortly. I'll update here when that's done. This has been completed, you can install http2 again. @cPanelJacob can you share this changes? As a heads up, we are working now to bring this module into our production repositories. We'll update this when we've completed our work. What Mark said... are you able to give an ETA for this? Good News. Anyone know what the ballpark time for getting something from Experimental to Production is? This is fantastic news! Thank you! When will it be in production? In the next update of version 64 or 66? Will this module update also and OpenSSL to OpenSSL 1.0.2 k ? Apache 2.4.26 could be released next week and includes a ton of HTTP2 changes, improvements and fixes. We hope to have this in our production tiers within the month. We have a scheduled release next week for PHP updates, but unfortunately these changes won't make it in time for that release. We will be building nghttp2 and the mod_ssl w/http2 module statically against a newer version of OpenSSL. This package, while it will be on our mirrors, won't be needed as we're building it statically. Amazing, keep the good work up!! Woohoooo!! Can't wait till the end of the month!! "The new updated Alt-PHP packages with HTTP/2 support are available for download from our production repository." Our server is running EA4 and the php would be ea-php packages. You're talking about alt-php packages from cloudlinux but apparently, HTTP/2 support for EA4 is still listed under feature request, right? So we have to wait until a cPanel update rolls out for this? Do you have an estimated date for this? Improved http/2 support released in Apache 2.4.26 the 19th of June. http/2 is no longer marked experimental and alot of other bug fixed for mod_http2. Good news everyone! We're aiming to move this to production on July 11th. I'll let you know if anything that changes! I'll admit I haven't looked a whole lot into http/2 yet, but I see a post above saying ONLY https is allowed with it. Can you confirm this? Will we be forced to have all connections as https if we choose to use this? morrow95 - Straight from the wikipedia page:Although the standard itself does not require usage of encryption, most client implementations (Firefox, Chrome, Safari, Opera, IE, Edge) have stated that they will only support HTTP/2 over TLS, which makes encryption de facto mandatory. ... so the browsers are essentially going to deny access to a site through http? No fall back of any kind on either side? Not. If you site have a SSL certificate, the browser load http/2 with ssl support, if dont, only load http, no more. Okay, so there are two conflicting answers here - which is correct? Browsers won't be denying access. If the site has an SSL/TLS certificate then HTTP/2 ( if installed correctly ) will work. If no certificate then HTTP/1 will be used. Google uses HTTPS as a ranking signal, so websites with HTTPS will rank higher. With Comodo / Let's Encrypt out of the box in CPanel why are you not using HTTPS? Hey all! This conversation has gotten pretty far away from the details of our implementation of this feature. When we push this to production I'll make sure all of your questions are answered. In the meantime, if you'd like to have further discussion about this feature, feel free to open a thread on the cPanel forums! It's a great place for conversation. Hiya! Unfortunately we had to delay our release today due to some build system issues. We're on track to hit the release tomorrow, so we should have mod_http2 out then. Thanks for your patience! What's the latest on the release? If anything, PHP 5.6.31 should be released immediately ahead of the HTTP2 update as it contains security fixes. Just noticed YUM pulled in PHP 5.6.31 last night along with updates for Apache 2 and HTTP2, but the changelog remains out of date. Is the new HTTP2 support now live then? If this drops the same week as the Game of Thrones premier I'm not sure I'll be able to handle the excitement. 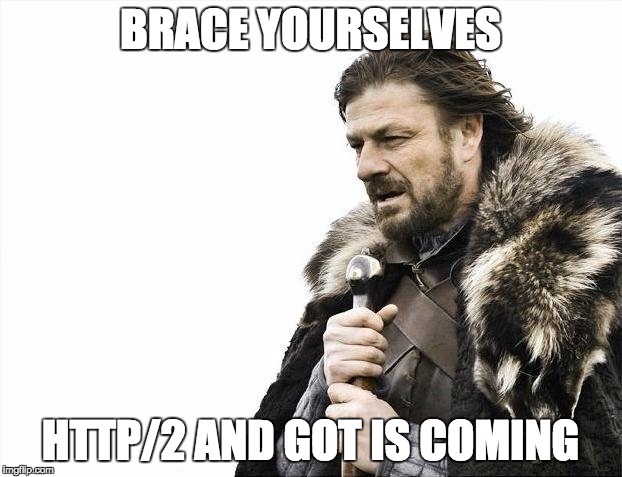 HTTP/2 is coming. ea-apache24-mod_http2 has been published to the production repository and is available for installation. Thank you! How long does it usually take to update the change log? Hello, can you tell us please how will we install it if we installed the pre release before? In 2.4.26 I changed the (undocumented) default from 1 to 4 h2 workers, which brought us to the issue I linked. The easy fix is 'H2MaxWorkers 1' in the config and you have the pre-2.4.26 behaviour. Regardless of the discussion if the change in 2.4.26 was reasonable or not: it is not possible to map the prefork single-thread requirement on to HTTP/2. Not going to work. One long running request, one websocket opened, and your browser will stall. This is not a bug, it is the collision of the processing models.